L-R: Commissioner for Tourism, Arts and Culture, Mr. Steve Ayorinde; Ex-Nigeria International, Austin JayJay Okocha; UEFA Champions League winner and former Barcelona FC Defender, Carles Puyol; representative of Lagos State Governor and Chairman, the State Sports Commission (LSSC), Dr. Kweku Tandoh; Managing Director, Nigerian Breweries PLC, Mr. Jordi Borrut Bel; Special Adviser to the Governor on Education, Mr. Obafela Bank-Olemoh; Director-General, LSSC, Mr. Babatunde Bank-Anthony and Chief Press Secretary to the Governor, Mr. Habib Aruna during the UEFA Champions League Trophy Tour to the Lagos House, Alausa, Ikeja, on Wednesday. The Governor of Lagos State, Akinwunmi Ambode, on Wednesday, said that buildings within the vicinity of the collapsed building at Ita-Faji, on Lagos Island, would be subjected to integrity tests. Ambode said this as he visited the scene of the collapsed three-storey building, which housed a primary school. He said that if any of the buildings failed the integrity test, it would be demolished. Akinwunmi Ambode, governor of Lagos state, has finally presented the year 2019 budget to the state house of assembly. The governor had met a brick-wall in his bid to present the budget on previous occasions. Lawmakers had accused him of incurring expenses from the budget without presenting it, threatening to commence impeachment proceedings against him. But leaders of the All Progressives Congress (APC) in the state, including Bola Tinubu, had reconciled the governor and the aggrieved lawmakers on Sunday. Two days after, Ambode presented a proposal of N852.316 billion before the assembly, saying it had been carefully prepared to be all-encompassing and dedicated to complete major ongoing projects in the state. The governor said N462.757billion representing 54 percent of the total budget size had been earmarked for capital expenditure, while N389.560billion representing 46 percent had been dedicated to recurrent expenditure. He said key projects such as the Oshodi-Murtala Muhammed International Airport Road and Oshodi Interchange Terminal, among others would be completed. Giving details of what informed the budget size, Ambode said the performance of the 2018 budget of N1.046trn as of November 2018 stood at 60 percent owing to reduction in revenue projections, while the total revenue stood at N530.192 billion. The Lagos State House of Assembly on Monday frustrated the bid of Akinwunmi Ambode, governor of the state, to present the 2019 budget. Unlike in the last three years when the exercise went smoothly, the governor met brick wall in his attempt to lay his last budget before the lawmakers. When around 3pm, there were signs that the appropriation bill would be presented, journalists trooped to the assembly. But 20 minutes later, an official at the assembly briefed the reporters that the presentation would no longer hold. “I know you are journalists and here for your job but the budget will not be presented today,” he said. As of the time of filing this report, the advance team of the governor were still within the premises of the assembly while the parliamentary session is ongoing. There had been reports of attempt to impeach the governor but Mudashiru Obasa, speaker of the assembly, has denied this consistently. Shortly after he lost the governorship ticket of the ruling party to Babajide Sanwo-Olu who has the support of Bola Tinubu, a national leader of the party, and key APC members in Lagos, the assembly reviewed the waste evacuation policy of the state without consulting the governor. Ambode had disengaged the PSP operators following the introduction of the Cleaner Lagos Initiative, through the Visionscape Sanitation Solution Limited but the assembly overruled the governorin October and directed the PSP operators back to work. Lagos State Governor, Mr. Akinwunmi Ambode, on Monday, officially endorsed the governorship candidate of the All Progressives Congress (APC) in the state, Mr Babajide Sanwo-Olu, and his deputy, Dr. Obafemi Hamzat, saying that the duo were prepared for the campaign and ready to take on the task of moving the State to greater heights. National Leader of the party, Asiwaju Bola Ahmed Tinubu, on his part, commended the courage of Ambode and others for accepting the outcome of the primaries of the party, saying their act of sportsmanship deserved to be appreciated. Governor Akinwunmi Ambode of Lagos State, on Saturday, urged voters in Epe Divison to vote en masse for candidates of the All Progressives Congress (APC) during the 2019 elections. “I want to thank Governor Ambode for being a man with a large and great heart. “Governor Ambode has done his best and we will do our best to continue his legacies and build on what he has done to further develop our dear state, ‘’ Hamzat said. At the meeting were Senator representing Lagos East, Gbenga Ashafa; and a member of the House of Representatives representing Epe, Wale Raji. Others were Chief Lanre Razaq, former House of Assembly Speakers, Adeyemi Ikuforiji and Jokotola Pelumi; Alhaji Akanni Bamu, among others. 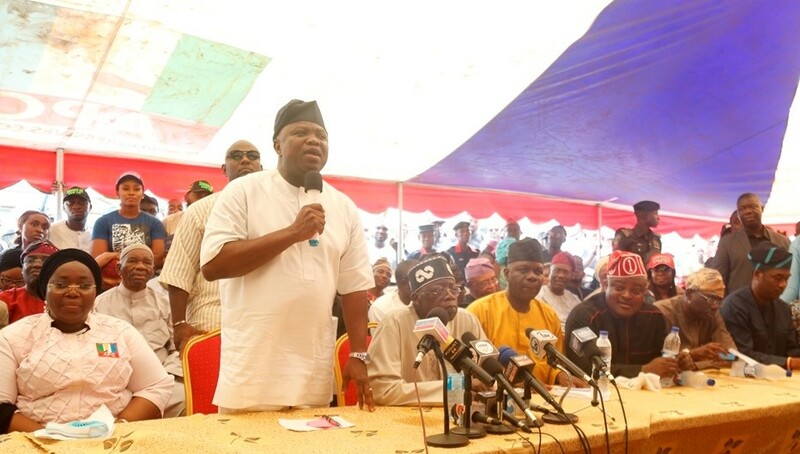 Lagos State Governor, Mr Akinwunmi Ambode on Thursday assured that the Governorship candidate of All Progressives Congress (APC) in the State for the 2019 general elections, Mr Babajide Sanwo-Olu will not abandon ongoing projects but rather complete and build on the enduring legacies already put in place by his administration. Governor Ambode, who said this while inaugurating an ultra modern lecture theatre donated to the Lagos State University (LASU) by businessman and philanthropist, Mr Remi Makanjuola, said while efforts were on to complete all the major projects initiated by his administration, Sanwo-Olu would nonetheless complete those ones he is unable to deliver before the expiration of his tenure next year. “I am so excited about the fact that Mr Sanwo-Olu has actually come out here and he has issued a promissory note and what that mean is that we are going to have a government of continuity. “For whatever structures that we have in LASU right now, and I’m going to also convince our chief negotiator, Dr Wale Babalakin, we are already doing Senate building here, we are doing Students Arcade and we are also doing the Library, I hope I will be able to complete and finish them but if I am unable to complete them, I speak on behalf of Mr Sanwo-Olu that he will finish and also do the Staff School. “We are not campaigning yet but truly that is the spirit of the kind of governance that we bring to Lagos; that is the spirit that we really want to see and then we should be able to show leadership in all spheres of life that we find ourselves,” Governor Ambode said. Speaking on his administration’s intervention in the educational sector, he said in the last three and half years, at least N15billion has been invested in revamping infrastructure in schools across the State to ensure students can learn in a conducive environment, while 3,400 primary and secondary teachers were employed to improve the teacher to student ratio as well as quality of learning in schools. The Governor said beyond the upgrade of infrastructure, the State Government developed innovative solutions to bridge gaps in education system, and to position Lagos State for a technology-driven future including the ReadySetWork and CodeLagos initiatives, noting that while 34,000 students have graduated from the former, the latter is geared towards teaching one million Lagos residents to code. “At the grassroots level, faced with the realization that about 3 million Lagos residents could not read or write in any language, we commissioned Eko Nke Koo (Lagos Is Learning), an initiative aimed at raising the literacy rate in Lagos State from its current 87% to 95%. “Through Eko Nke Koo, the Lagos State Agency for Mass Education increased the number of adult literacy centres across the State from 532 centres in 2016, to 782 as at January 2018. “We have also recorded improvement in enrolment and retention rates of learners in the programme. In 2017, 98% of enrolled learners graduated from the programme,” Governor Ambode said. He said in LASU, his administration had also carried out notable projects targeted at ensuring the institution remains academically competitive, financially viable, and most importantly, conducive for learning. The Governor noted that last year, the State carried out major infrastructure development and road works to give the school a facelift befitting of its status as one of the top State Universities in the country, while it had also benefited from a significant increase in subvention to assist in ensuring smooth running of the school. He disclosed that he had approved for the development of a 6,000 bed hostel which according to him, will increase accessibility and improve security for students in the institution, as the demand for higher education continues to grow. “Reflecting on these investments, I must acknowledge it has been the privilege of this administration to build on the works of visionaries who came before us; and to be given the opportunity to raise the mark higher as we look ahead to a bright future for our State and Country,” Governor Ambode said. The Governor also seized the occasion to commend the Makanjuola for donating the ultra-modern lecture hall to the institution, saying that the gesture would forever be remembered by generations. “It has also been a true privilege and honour to work alongside collaborators – whether large scale organizations or well-meaning individuals in society – who recognize their role in State and Nation building, and have worked tirelessly to support the efforts of government. “Today’s occasion is symbolic of this citizen-partnership. Indeed, Mr. Makanjuola has sown a seed that would outlive him by bequeathing this Ultra-Modern lecture Theatre to the University. Sir, this is a gesture that will be remembered for generations and for that we are eternally grateful. And in the same vein, on behalf of the Government and people of Lagos State, and the entire Lagos State University community, I say a very happy birthday to you, Sir. In another 48 hours, our philanthropist will be 70 years old. Congratulations, Sir,” he said. Lagos State Governor, Mr. Akinwunmi Ambode on Saturday lauded the Federal Government for the commencement of the reconstruction of the Apapa-Oshodi-Oworonshoki-Ojota Expressway, saying that the project would bring permanent relief to motorists and residents over the perennial gridlock in the axis and enhance movement within the State. Governor Ambode, who spoke at the flag off ceremony in Apapa, held under the auspices of the Federal Ministry of Works, said the development was a historic moment for residents in the State as it was the first time that any government would embark on a total reconstruction of the road since inception. He said it was particularly gratifying that the project would be done using concrete, expressing optimism that it would ensure that the road would last for over forty years. “Whatever it is that has been taking place in this particular project has always been rehabilitation and every Nigerian should be reminded that this road has been in place for more than 40 years. “This is the first time the government at the centre is embarking on reconstruction, that means we are going to excavate everything all the way from Apapa, Oshodi to Oworonshoki and Ojota Expressway and actually reconstruct it, using concrete instead of asphalt because Lagos is below sea level, if you use asphalt, within seven to eight years, it would wash away because we are under water. “So the concrete template is being used to give us a long lasting solution to this Apapa gridlock and this road will last for more than 40 years and we believe strongly that the PPP platform that has been given to this project to allow the private sector invest their money in it being driven by Alhaji Dangote is the best solution that we can use to develop public infrastructure right now and we must commend the Minister for that,” the Governor said. He also thanked the Federal Government for approving the construction of the Agbara Seme Expressway, saying that while the State Government was committed to completing the ongoing works from Eric Moore to Okokomaiko, the decision to award the Agbara axis to Seme as a step in the right direction. Besides, the Governor said beyond road reconstruction, emphasis must be placed on evolving a workable interconnectivity of rail, road and water transport systems, while commending the Federal Government for taking steps towards that effect. “You would recall a few months ago that the Vice President was here in Lagos to activate the rail construction that is taking place between Apapa-Iddo-Agege-Abeokuta-Ibadan routes. “What this means for us is that while we are constructing this and we are able to deliver on the rail project, goods can be carried out straight to the Ports from the rail. So by combining the rail and road solution that is being offered us by the Federal Ministry of Works and also Transport and totally by the Federal Government, Lagos State is proud to say that this is a major solution that would bring comfort to all the residents of Apapa,” Governor Ambode said. He thanked the Minister of Works, Power and Housing, Mr. Babatunde Fashola for facilitating the refund to the State Government for some of the Federal projects embarked upon, saying that his administration was already in the process of utilizing same to deliver other ongoing projects within the next few months. The Governor, however, seized the occasion to appeal to residents for understanding, saying that though the commencement of the project might bring some inconvenience, the end result would be a permanent solution to the gridlock that has bedevilled the area over the years. He assured that the State Government on its part would deploy more traffic and enforcement officers to ensure free flow of traffic in the course of the construction. “The future of development and infrastructure actually lies in the present administration and the future of the prosperity of this country lies in the hands of President Buhari and we make no mistake about it that it is in our own interest that we continue to support the present government of APC at the centre and also at the State for continuity and greater deliverables of infrastructure, goods and services,” Governor Ambode said. Akiolu advised President Muhammadu Buhari to prevent former President Olusegun Obasanjo from “escaping” if he wins reelection in 2019. Governor Akinwunmi Ambode of Lagos State on Tuesday said he would lead a strong campaign to ensure victory for President Muhammadu Buhari and the All Progressives Congress (APC) Governorship candidate in the State, Mr. Babajide Sanwo-Olu in the 2019 general elections. Governor Ambode, who spoke to journalists at the Presidential Wing of the Muritala Mohammed International Airport shortly after he accompanied President Buhari to perform the official commissioning of the new Economic Community of West African States (ECOWAS) Border Posts at Seme-Krake joint border post in Badagry, said it was important for the APC to retain its leadership positions both in the federal and the State level. “I have just accompanied Mr. President to the Nigerian-Benin Border Post. So what we have commissioned today is a joint Border Patrol post between Nigeria and the Republic of Benin and it is called Semo-Krake Border Post. “We are going to campaign heavily for him. I am also committed to ensuring that the APC wins the governorship election come 2019. We support the candidacy of Babajide Sanwo-Olu and we would make sure that APC retains Lagos State and the centre,” Governor Ambode said. Earlier, Governor Ambode had received President Buhari at the airport before the duo proceeded to Seme where the President joined his Republic of Benin counterpart, Patrice Talon to inaugurate the Border Post. With the inauguration, the Seme-Krake joint border, one of the busiest boundary lines not only in West Africa but the whole continent, daily recording huge movement of persons, goods and services, is expected to enhance the free movement of persons and goods in the region and foster integration between the people of Nigeria and Benin. Speaking on the floor of the House at the beginning of plenary, the Speaker, Mr Mudashiru Obasa, said there was no truth in the rumour. Obasa said that he received telephone calls and enquiries from prominent members of the public over the rumoured impeachment moves against Ambode. According to him, the Solidarity Group of Nigeria and a faction of the APC in Lagos State, led by one Fuad Oki has been insinuating that lawmakers in the state are threatening Ambode to open the state’s treasury. “We don’t need the wailers to guide us in performing our duties. It is not out of place for us to do our job,” Obasa said. He added that the populace would be informed if impeachment of the governor would happen. Also speaking, the Majority Leader, Mr Sanai Agunbiade, said that the constitutional procedure for impeachment did not harbour secrecy, saying that members of the public would know if such would happen. The speculation around the purported impeachment plot gained traction after the House on October 25, ordered the 20 Local Government Councils and the 37 Local Council Development Areas in the state to direct operators of the Private Sector Participation (PSP) contractors, involved in refuse clearing in the state to go back to work. The House disowned Visionscape Sanitation Solutions that was contracted by Ambode to take over refuse clearing in the state from the PSP operators over a year ago. The House stated that the State Government would have to return all the money it had paid to Visionscape. The lawmakers said that heaps of refuse all over the state was an indication that Visionscape lacked the capacity to do the refuse clearance job. Ambode had since lost his bid to go for a second term, following the governorship primaries of APC. Ahead of the 2019 governorship election in Lagos, the State Governor, Akinwunmi Ambode, has assured citizens that his programmes and policies would be sustained by an All Progressives Congress, APC governor in the state. Ambode’s assurance came barely weeks after losing his second term bid at the APC gubernatorial primaries to Babajide Sanwo-Olu, an ex-commissioner in the state. The Governor, while addressing congregation yesterday at the 9th Tradesmen And Artisans has Week & Graduation Ceremony for Re-Trained Artisans which held in Ikeja, stressed that the programme and policies of his administration were already embedded in APC manifesto, describing it as a great party. The governor, who was represented by Secretary to the State Government, Mr. Tunji Bello, said: “You can therefore be rest assured of the continued sustenance of this programme by an All Progressives Congress-controlled government in Lagos State. We thank all organisations and individuals from the organised private sector that have joined hands with us in our determination to improve the competence and socio-economic condition of our artisans. “Our government will continue to work in collaboration with relevant stakeholders to design and executive programmes, to enhance the productivity of tradesmen because, growing the capacity of tradesmen and artisans remain a key component that we cannot afford to ignore,” Ambode added. The governor implored the over 1, 500 graduands of the artisan up-skilling training programme to take advantage of the opportunities provided to be financially independent, become employers of labour and continue their quota to the growth and development of the state and her economy. He noted that in the last three and a half years, through the Ministry of Wealth Creation, his administration had showed unwavering commitment to tradesmen and artisans in the state. “In addition to providing a platform for individuals and groups to contribute their quota to the economic development of Lagos State, we have recognized and celebrated the progress made by the groups of artisans and tradesmen in the state”, he added. Lagos State governor, Akinwunmi Ambode and his likely successor, Babajide Sanwo-Olu have appeared together for the first time in public since the governor was denied a second term on Tuesday’s All Progressives Congress guber primaries. Ambode had launched a scathing attack on Sanwo-Olu prior to the primary but concesed defeat and congratulated him after the results were announced. Both men are currently at the ongoing APC Convention where President Muhammadu Buhari is expected to be endorsed as the sole presidential candidate. Meanwhile, security is tight in and around the Eagle Square, Abuja, as the National Convention of the All Progressives Congress (APC) gets underway. At least 7,000 delegates from all over the country are expected to gather at the venue to ratify the candidacy of President Muhammadu Buhari as the party’s flagbearer for next year’s presidential election. Newsmen report that all roads leading to the venue have been shut to vehicular traffic by combined teams of heavily armed security personnel. The agencies involved include: the Nigeria Police Force, the Nigeria Security and Civil Defence Corps (NSCDC), the Department of State Services (DSS) and the Nigerian Army. Safety and emergency services such as the Federal Road Road Safety Corps (FRSC), the FCT Vehicle inspection Office (VIO) and the Federal and FCT and Fire Services are also taking part in the exercise. Governor of Lagos state, Mr. Akinwunmi Ambode, has accepted has accepted his loss of the gubernatorial primary election of the All Progressives Congress (APC), congratulating Babajide Sanwo-Olu, winner of the exercise. “Fellow Lagosians, the last few days have witnessed intense political activities that have gripped the attention of the nation and created palpable tension in the polity,” he said. He also promised to ensure a smooth transition. Ambode thanked Bola Tinubu, his estrange godfather. The governor also expressed gratitude to the people of the state for giving him the opportunity to serve. “The progress of Lagos state is non-negotiable. It is a project that I have passionately worked for in the last three and half years as your Governor and one to which I will forever be devoted. Since the return of democracy in 1999, Ambode is the first governor of the state to serve a term. The chairman of the primary election panel of the All Progressives Congress (APC) in Lagos, Clement Ebri, has declared Babajide Sanwo-Olu as winner of the exercise in the state. Ebri made the declaration at a press conference in Lagos on Wednesday morning. He had earlier distanced the committee from the election, opposing the open ballot system used. Ebri had said arrangements were in place to commence fresh elections where the secret ballot would be used. But Tunde Balogun, chairman of the APC in Lagos, disagreed with Ebri, saying the election went on peacefully across the state. Balogun had declared Sanwo-Olu winner of the exercise, announcing that he polled 970,851 votes while Ambode secured 72,901 votes. However, at his media briefing on Wednesday, Ebri reeled out the same figures. The NWC panel’s initial position had sparked confusion among members of the ruling party and residents of the state. Ebri had said the need for equity and fairness made his panel to reject the primary. “First and foremost, yesterday (Monday) we held a stakeholders meeting; certain submissions were made and on the basis of these submissions, I contacted the national headquarters and they asked us to adjust the procedures in line with the provisions,” he had said. However, after consultation with the National Chairman of the party, Adams Oshiomhole, it was lesrnt that Ebri was told to accept the results. It was not immediately clear if the Ambode camp will challenge the decision in court. Governor of Lagos State, Akinwunmi Ambode has rejected results from Tuesday’s All Progressives Congress Primary election. All Progressives Congress (APC) in Lagos State on Tuesday night declared Babajide Sanwo-Olu as winner of the gubernatorial primary election held in the State. Although the exercise was declared cancelled by the party’s National Working Committee, the State chapter went ahead to declare the former commissioner winner. In the statement, the organisation argued that there were guidelines and procedures which the NWC said must be followed in conducting a credible poll but which were not followed.